Hospital Hill Location! This impressive home is situated on a nice corner lot in a great neighborhood! The owners apartment offers a custom cherry cabinet kitchen, gas stove, beautiful granite counters, and a large pantry. A formal size dining room with gleaming hardwd fls, crown molding & ceiling medallion with recessed lighting. Large sun filled living rm with beautiful hardwd fls, three bedrms with a large master, full bath with Jacuzzi tub. There are many custom features throughout. The first floor offers a beautiful oak cabinet kitchen, newer wall to wall carpeting, ceramic tile bath & Jacuzzi tub and two spacious bedrms. The 3rd floor apartment has four spacious rooms and 1 bedrm. Long term owners have beautifully maintained this home. Pride of ownership shows throughout. Large two car garage/workshop, full basement with high ceilings, upgraded electrical & heating system, new architectural roof being installed. 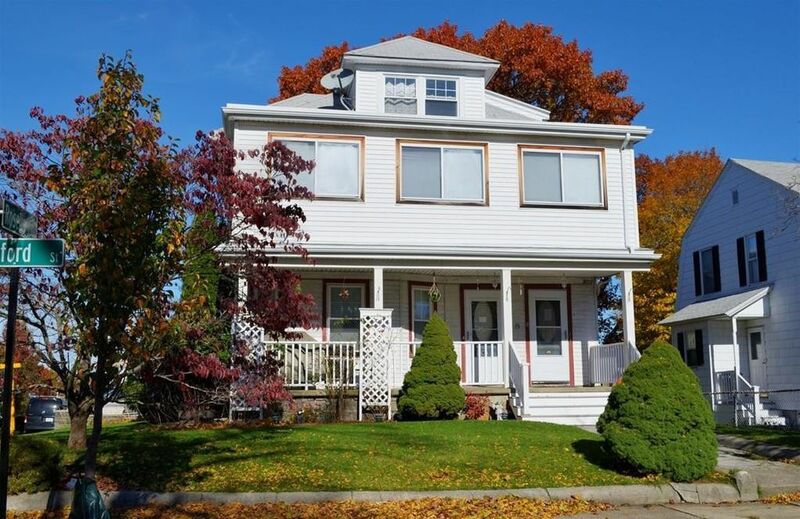 A five-minute walk to Quincy Center Red Line & Commuter Station.